It’s all about the layering. Seriously, for the past 5 days I’ve been wearing 2 pairs of socks, tights/leggings under my jeans and sometimes 5 or 6 layers on top (tank tops, t-shirts, long sleeve shirts, sweater, 2 zip up hoodies …) Have I mentioned I HATE being cold?? Because it’s a novelty and this is the most snow Nashville has seen in the 6 winters we’ve been here, I did take quite a few photographs. I guess I can appreciate the beauty of it a little bit. 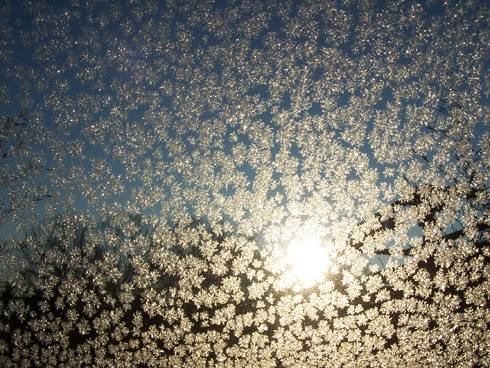 The frost on my car windows when the sun shines on in the morning is particularly charming. There is a joke around these parts that anytime there are flurries in the forecast, everyone runs out to the grocery store to stock up on bread and milk in case they’re snowed in for days. It’s true – avoid gas stations and groceries stores! I’m very thankful for the new down puffer coat I got for Christmas. Thanks Mom. Cute rain boots – zero insulation but 100% water proof. Ok. I’m ready for summer now. Bring on the heat! This entry was posted on Tuesday, January 12th, 2010 at 9:00 am and is filed under Art, Art: God's creation. You can follow any responses to this entry through the RSS 2.0 feed. You can leave a response, or trackback from your own site. Ahhh. A Snowstorm. Hee hee! (I really do appreciate how it means something completely different depending on where you are living and how long you have lived there!) I’m glad you didn’t stay snowed in for long and that you had bread, milk, & toilet paper! Goodness! wow, you wear more layers than me!!! i need to get me some leggings to wear under my jeans!! cute pictures from your house . . . i didn’t honestly believe you had snow that stuck until i saw the pictures!